We'd love to share great teaching tips with you! Personalized Learning can help teachers meet the learning goals and needs of each and every learner. 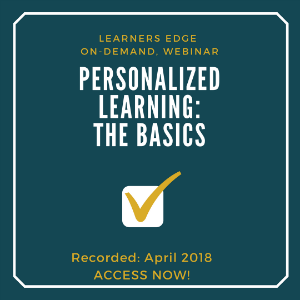 Join us for this webinar on the basics of Personalized Learning where we will discuss the definition and components of the model, the benefits of implementation and easy, applicable strategies and resources to get you started! We understand that teachers get busy. If you missed a recent webinar, don't fret! Our webinars are recorded and available on demand to fit your busy schedule. 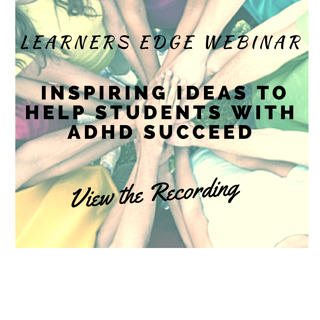 Learners Edge webinars are typically thirty minutes to one hour in length. We hope you find them valuable! Project Director for The Minnesota Association for Children's Mental Health Deborah Cavitt joins us to share her knowledge and expertise concerning the impact of children's mental health on schools. Mental health is important at all ages, but learning the nuances involved with the mental health of our youngest students helps us ensure they are on a trajectory of wellness. 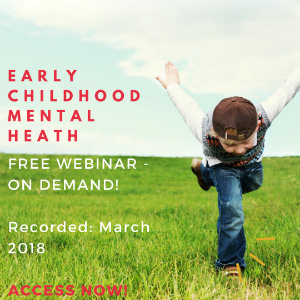 In this one hour, on demand, webinar, we will cover diagnoses, trauma, bullying, our hopes for the future, and much more. 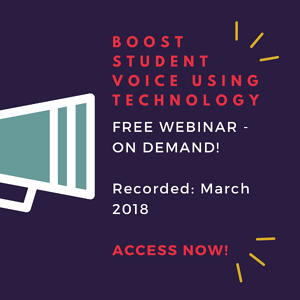 Join us for this 20 minute, on-demand webinar focused on amplifying your student's voices! Research tells us that one of the most impactful ways to enhance academic achievement is to encourage and amplify student voice. With BYOD classrooms and one-to-one district initiatives, students can now express their thoughts and feelings, make their own learning choices and partner with the greater community, all with just a few clicks. Create a more connected, inquisitive and energized culture of learning! 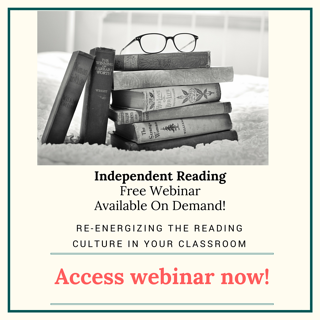 Join us for this hour long, on-demand webinar focused on inspiring Independent Reading in your classroom. Reflect on your own independent reading, discover strategies to encourage and support independent, life-long readers and up-level your independent reading plan to re-energize the reading culture within your classroom! Barb Istas, a 25-year elementary school teacher, current Learners Edge Curriculum & Instruction Specialist, and official reading aficionado, will present this engaging and important topic! 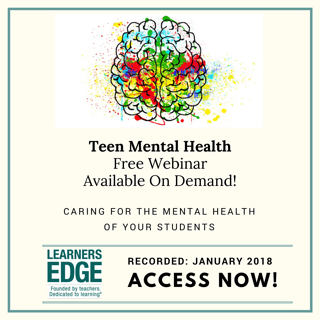 Join us for this 50 minute, on-demand webinar focused upon Teen Mental Health. Featuring Sarah Johnson, M.S., L.P.C., aka: "The Happiness Fairy", a Mental Health Director at the LaCrosse Area YMCA, you will leave this webinar with strategies to identify mental health concerns, suggestions on ways to mitigate triggers, and self-care techniques to help you be at your best so that you can effectively care for others! 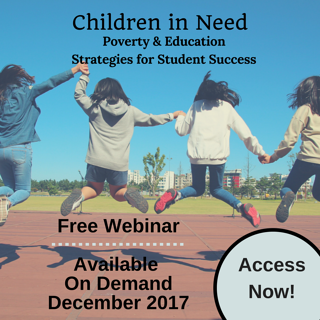 This 40 minute webinar will discuss how children are affected when growing up in an impoverished household, strategies educators can use to help connect with at-risk students, and suggestions you can implement in your school or classroom to help them succeed! Former high school teacher and Curriculum and Instruction Specialist, Dawn Butler, will share her experiences with students in poverty and be joined by Blessings in a Backpack CEO, Brooke Wiseman, who will tell us about the impact this important organization is having across the United States! As general education teachers, we may be confused - or just curious - about the language of special educators, IEPs, SEL, ASD, 504s… as well as, their unique ability to connect, teach, and guide children with special needs. 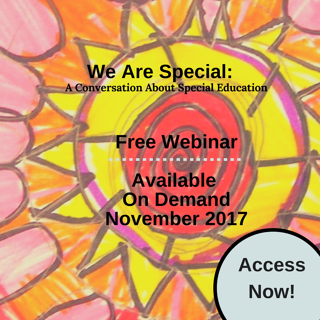 Join us for this 30 minute on-demand webinar “We Are Special: A Conversation About Special Education: Then, Now and Our Hopes For The Future,” as we talk with two special educators—currently part of the Learners Edge Curriculum & Instruction team. They will share their real-life experiences and heartfelt stories, as well as some special education basics: accommodations, modifications, assistive technology, strengths-based learning, and working with the parents of your students with special needs. Research shows that culturally relevant teaching can increase student interest, engagement and retention of classroom content. 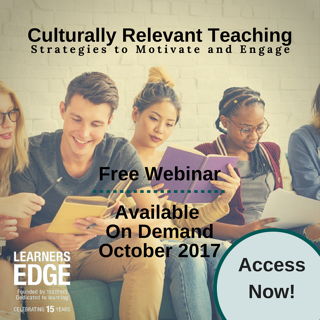 But, what does culturally relevant teaching look and feel like? Hint: It’s not about hanging multicultural posters and teaching Shakespeare with hip hop beats. This webinar will clear up some common misconceptions and provide you with strategies you can use whether you are a teacher or support staff, working in urban or rural districts. Are you looking for new ways to create balance and manage stress in your life? Are you interested in bringing Mindfulness strategies into your everyday teaching routine? Join us for this 40 minute webinar on the power of mindful thinking! 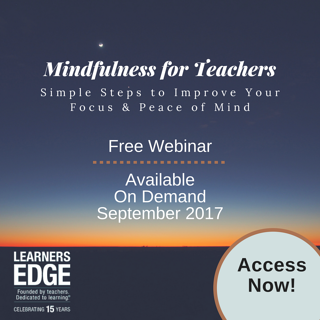 We’ll discuss how to get started with Mindfulness in your own life and some simple first-steps to bring Mindfulness into your classroom. Teachers often cite “Parents” as one of the biggest challenges in their day to day work lives. How do you build bridges with parents? How do you help them understand you are all working in the best interest of their child? 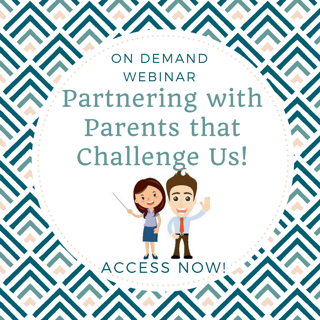 Access this informative webinar as Keely Swartzer, Learners Edge Director of Professional Development and former Special Education Teacher and Administrator, shares thoughts and strategies surrounding how to work with even the most difficult parent(s) for positive student outcomes. You will come away with ideas and downloadable help sheets for communicating difficult information, navigating conflict and facilitating successful meetings. Words are the building blocks for learning. Reading, writing, speaking, listening – all require vocabulary skills. Students can’t master math or science concepts without the ability to read and comprehend words – volumes of words. Virtually all subjects taught in schools today (from Pre-K to 12th grade) require specific vocabulary knowledge for achievement of any content. Research supports the need for explicit vocabulary instruction, and it also reveals that too many teachers are leaving this important instruction to random word exposure and daily encounters with assigned reading. 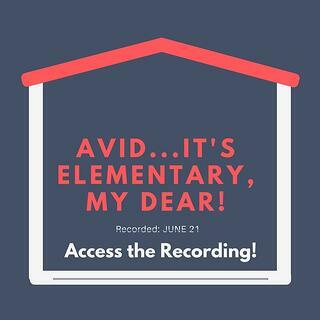 AVID Elementary is a program independent of any specific curriculum that provides best practices of instruction, organization, and culture to support all students’ academic success. Sumner Elementary School, in Austin, Minnesota, is in year three of the implementation. AVID Elementary has added rigor to Sumner students' education and changed the mindset of teachers and students! Join host Julie Yaeger, Vice President at Learners Edge, and the Principal of Sumner Elementary School, Sheila Berger to discuss AVID Elementary and how an AVID program could work in your school! Collaborative learning is an essential 21st Century Skill for learners in our global society. In this 30 minute webinar, former English teacher and Lead Course Specialist Dawn Butler will focus on the research and rationale for collaborative learning, and discuss ways to ensure participation and engagement for all students. This is a great opportunity to learn about new collaborative techniques- beyond the jigsaw! Being a teenager can be a wonderful time, but it is also a time when bodies and brains are rapidly changing. Hormones, stress, relationships, media, bullying - and plenty of other pressures combine and can cause erratic behaviors, risky decisions, and impulsivity. 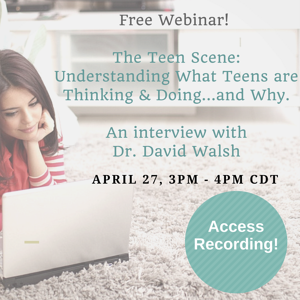 Whether you work with this age group or simply want to learn more about adolescents and teens, enjoy this conversation with psychologist Dr. David Walsh author of Why Do They Act That Way? A Survival Guide to the Adolescent Brain for You and Your Teen. Walsh will provide practical strategies and advice for working with this spunky and talented age-group. Are you an educator who believes we learn best by doing? Do you want to help your students develop 21st Century skills? 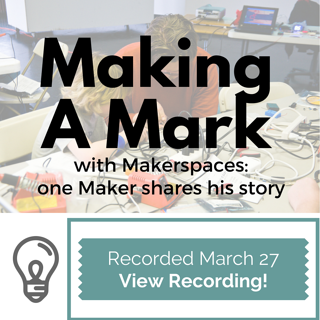 Have you heard about the exciting new Maker Movement and want to know more about how you might make your mark with a Makerspace? Sir Isaac Newton said, “If I have seen further, it is by standing on the shoulders of giants.” Get tips, tricks, ideas and inspiration from Chad - a real life maker! Hosted by Nancy Lindfors, Learners Edge Manager of Evaluation and Degree Programs, we’ll discuss how to get started creating a Makerspace, who to add to your team, and how to make your space sustainable. Come join us to learn more about how to start making at your school. Recognize the importance of building teacher resilience through this informative, interactive session for teachers and administrators. 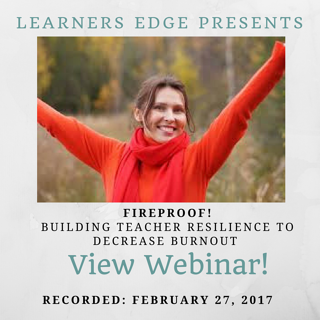 Learn about resilience and the impacts of teacher burnout on a school community. 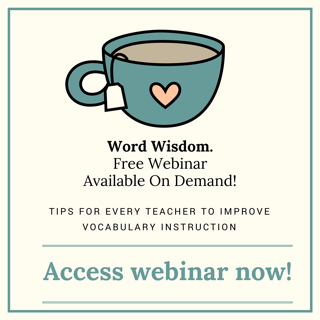 After this webinar, you will have easy to implement strategies to build teacher resilience through self-awareness, self-care, support measures, community building, fluff-eradication and efficient planning. In this webinar, you will learn how to care for your students and yourself as you develop trauma-sensitive strategies to meet the needs of all learners. Beginning with brain research, discover the impact trauma has on students’ emotional and academic development. 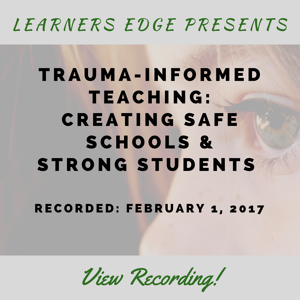 Explore the foundations of a trauma-informed classroom, including an emphasis on relationship-building, student choice, safety, and resiliency. Enjoy a conversation with Katy Smith - parent educator and 2011 Minnesota Teacher of the Year! Katy will join us to discuss what the research says about play and learning, how loss of play is affecting our students, her ideas for getting play back into the classroom, and how YOU can become a play advocate! In honor of ADHD Awareness Month, former Special Education Teacher, Jill Rockwell, shares easy to implement strategies for effectively teaching students with ADHD. Jill will share stories of techniques used with students – and the student's successes and challenges. Leave this webinar with tools and practical methods to apply immediately in your K-8 classroom, and equip students with skills to help them reach their goals. Brain science backs up the important outcomes of arts-integration, so why do we struggle to infuse the arts in our content and curriculum? 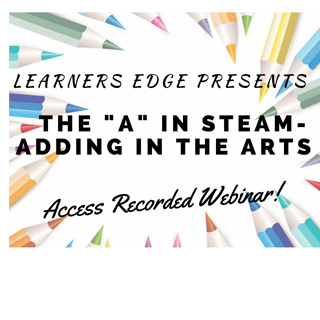 Tune into this informal exploration on why adding in the arts matters so much in every classroom. Your colleagues from the Learners Edge Curriculum & Instruction team will share a conversation about this important, yet often-overlooked element in instructional planning. We will share examples of how, when, and where the arts have created high engagement and energized learning for all, especially teachers!